Teeworlds Game - Download and Play Free Version! Use an Array of Weapons to Annhilate Your Opponents! 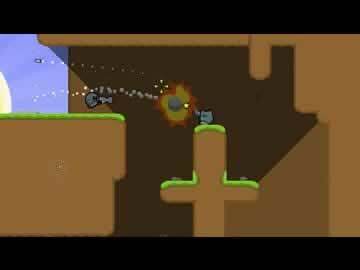 Platform, Multiplayer Shooter. 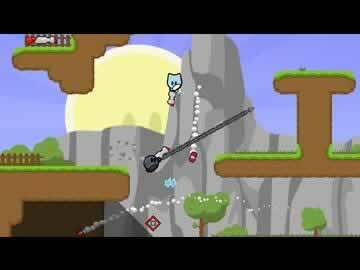 Experience unique online-multiplayer gaming as you take a cute video game hero and give him some real weapons to rip apart his enemies. Enter beautifully drawn worlds, which may remind you of some of the classics of old, that are chock full of pretty trees, smiling suns, and endearing houses. But it is not as peaceful as it looks as tees battle it out with grenades, bullets, and a variety of other weapons. With normal Death Matches, Capture the Flag, and Team Death Match modes, there is plenty of action to be found. Also, a lively open source community has arisen providing a plethora of custom game modes, maps, as well as weapon and character skins. The action keeps up a steady, frenzied pace with whatever game mode you select, but thankfully it is incredibly simple to start up the action. Your tee, a cuddly ball with a gun, has its movement controlled by the keyboard and aiming is done with the mouse. By default, you carry a hammer and pistol into each match, but there are a variety of weapons that appear at fixed respawn points, such as a shotgun, grenade launcher, laser rifle, and even a ninja sword. While the gamplay is easy to learn, it can be rather difficult to master with all the advanced moves which are available. For instance, a remarkable feature is the grappling hook which, when shot, attaches to any solid ground within range. This allows you to swing to isolated locations, move very fast and unpredictably, or even to toss your enemies around. With the wide array of weapons and strategic options available, it is easy to see how one could get drawn into the addictive gameplay of Teeworlds. Develop your own strategies and tricks to get that little edge over your enemies which may mean the difference between victory or defeat. 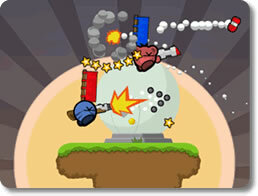 With battles that can hold up to 16 players, the action can get furious and chaotic at times. What makes Teeworlds a spectacular experience is the frenzied battles mixed with the nearly limitless amount of customization available. It's also quite nice that it is totally free! So if you like an addictive multiplayer experience with lots of action, download Teeworlds and start the fight today! Watch a short trailer of Teeworlds to get a peak at the gameplay waiting for you.